Soft cover book. 14 pages. 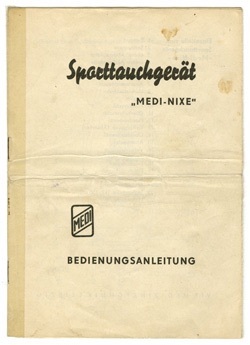 Instructions manual for the Medi ‘Nixe’ rebreather apparatus. Single page. 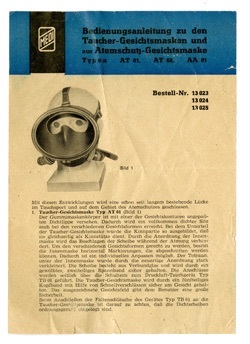 Instructions leaflet for the Medi Diving Mask. Soft cover 28 pages. 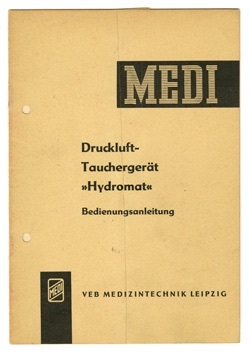 Illustrated instructions manual for the Medi / MLW SCUBA apparatus. Soft cover 16 pages. 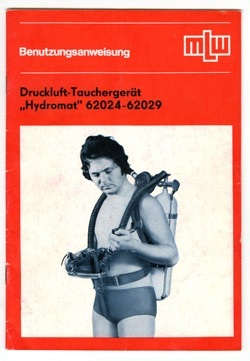 Illustrated instructions manual for the Medi ‘Hydromat’ SCUBA apparatus. KAUFE ALTE TAUCHERBÜCHER, UNTERLAGEN, KATALOGEN, FOTOS, POSTKARTEN USW!